Cartier is a jeweler synonymous with luxury and style. This luxury brand is no stranger to modern women of style and status, nor is the reoccurring panther theme that has stalked its way through a century of Cartier’s designs. But, the panther is not the only animal in the Cartier bestiary, a word which translates to the name of a decadent Cartier line—Bestiaire Watches. If you are looking for an eye-catching accessory to wear to a special event or just want to create a chic look for the evening, Bestiaire watches offer a precious menagerie of magnificent jeweled creatures that form the perfect accent. The collection features nine different models, each with an exquisite design in pink gold, white gold, and yellow gold case materials. These watches are a captivating addition to your accessories collection and easily become the focal point of any outfit. They all showcase alluring animals and delicate blooms rendered with the finest quality jewels. On many of the watches, the dial is secreted beneath a gorgeous ornament, rendering the piece a spectacular bracelet. 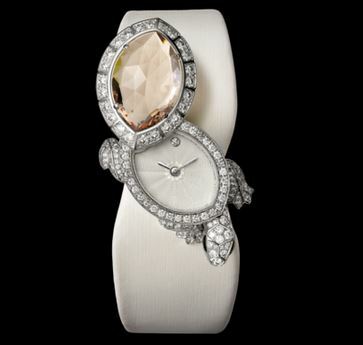 Made with quartz, white gold, diamonds, and green sapphires, this watch features a turtle with a morganite shell. The shell pivots away to reveal the delicate silver dial of the watch. The entire piece is covered with diamonds and accented with green sapphires. Another option is the same design with a white gold shell and emerald accents. The infamous Cartier panther looks out from this watch, creating a bold, sensual look. 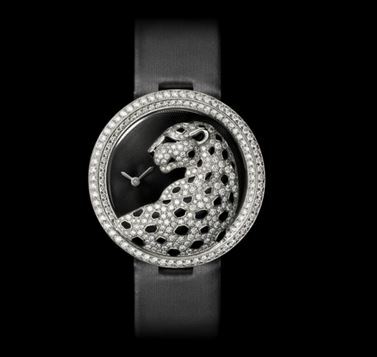 The panther head sits atop the dial and is adorned with rhodiumized 18K white gold and diamonds. A set of gleaming emerald eyes and onyx accents evoke the timeless elegance of the panther and the premiere quality of a Cartier timepiece. Where the Panthére Captive highlights the strength of Cartier panther, the Divine model focuses upon its sumptuous coat. Two rows of brilliant-cut diamonds surrounding the watch face, which develops drama with its attention to graphic lines. From the center of the timepiece, the panther’s profile languidly curves into its back, fashioned exquisitely in diamonds and enamel. Another panther design, the Féline has a bit more whimsy integrated into its design. A panther exquisitely composed of white gold set with 617 brilliant-cut diamonds surrounds the watch face in a similar fashion to the Ouroboros. 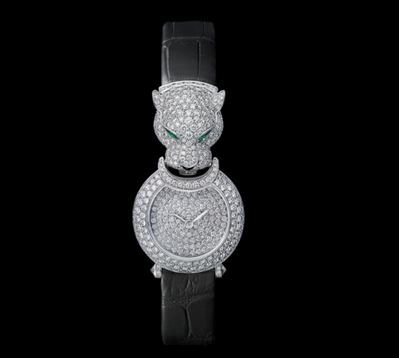 The panther features emerald eyes and an onyx nose as indulgent details on an opulent watch. Les Indomptables de Cartier portion of the collection is unique because each watch has a brooch component that can be worn as a part of the watch or worn alone, in either scenario, the watch itself remains stunning. 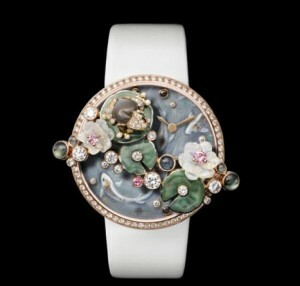 The whimsical version has a watch face enameled to look like a gentle Japanese pond with koi, lotus blooms and lily pads. The 18K pink gold brooch has more lush lily pads, one featuring a tiny white gold frog with emerald eyes, and lotus blossoms. Placed among the flowers are on the watch are 7 sapphires and 11 brilliant-cut diamonds. The brooch boasts 67 brilliant-cut diamonds, 3 moonstones, 18K white gold leaves set with brilliant-cut diamonds, lotus flowers in moonstones set with 8 pink sapphires, and 18K pink gold drops set with sapphires and brilliant-cut diamonds. 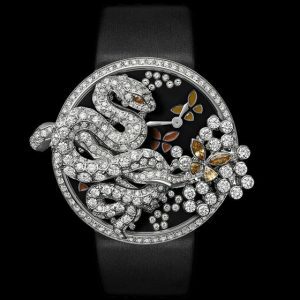 Another animal watch, scenery watch, and brooch, this design includes a rhodiumized 18K white gold snake brooch set with 249 brilliant-cut diamonds. A butterfly nestled among white diamond flowers adds a finishing touch to the brooch. A black enamel dial is accented with garnet butterflies and flowers made out of diamonds. In this exquisite timepiece, the animal, scenery, brooch design couples with the iconic Cartier panther. This iteration is breathtaking: boasting a rhodiumized 18K white gold panther and 18K pink gold foliage set with 472 brilliant-cut diamonds totaling 2.08 carats, eyes set with pear-shaped emeralds, black enamel nose, ears and spots. The brooch sits atop a black enamel dial accented with red enamel leaves for a stark color contrast. Yellow-orange accents and diamond-studded details complement the watch dial design.